by SIR EDWARD C. OZANNE, K.B.E., Bailiff. 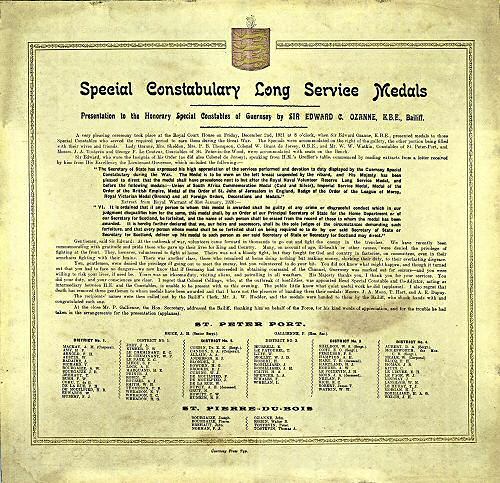 A very pleasing ceremony took place at the Royal Court House on Friday, December 2nd, 1921 at 8 o'clock, when Sir Edward Ozanne, K.B.E., presented medals to those Special Constables who served the required period to earn them during the Great War. The Specials were accommodated on the right of the gallery, the other portion being filled with their wives and friends. Lady Ozanne, Mrs. Sheldon, Mrs. P.B. Constables of St. Peter-in-the-wood, were accommodated with seats on the Bench. "The Secretary of State has expressed his high appreciation of the services performed and devotion to duty displayed by the Guernsey Special Constabulary during the War. The medal is to be worn on the left breast suspended by the riband, and His Majesty has been pleased to direct that the medal shall have precedence next to but after the Royal Naval Volunteer Reserve Long Service Medal, and before the following medals:- Union of South Africa Commemoration Medal (Gold or Silver), Imperial Service Medal, Medal of the Royal Victorian Medal (Bronze) and all Foreign Orders, Decorations and Medals." "VI. It is ordained that if any person to whom this medal is awarded shall be guilty of any crime or disgraceful conduct which in our judgement disqualifies him for the same, this medal shall, by Order of our Principle Secretary of State for the Home Department or of our Secretary for Scotland, be forfeited, and the name of such person shall be erased from the record of those to whom the medal has been awarded. It is herby further declared that we, our heirs and successors, shall be the sole judges of the circumstances demanding such forfeiture, and that every person whose medal shall be so forfeited shall on being required so to do by our said Secretary of State or Secretary of Scotland, deliver up his medal to such person as our said Secretary of State or Secretary of Scotland may direct."